Chargers remain alive in AFC wild-card with victory over Giants. SAN DIEGO (AP) — Philip Rivers and the San Diego Chargers still have Eli Manning’s number. Not the one briefly issued to Manning at the 2004 NFL draft, of course. Just another victory against him. Rivers found rookie Keenan Allen for two of his three touchdown passes, and the Chargers beat Manning and the New York Giants 37-14 on Sunday. The Chargers (6-7) kept alive their long-shot playoff hopes and helped eliminate the Giants (5-8) from the playoff picture. "If you said we were going to be one game out of a playoff berth with three games to play, it wouldn’t be ideal but I think we would sign up for that," said Rivers, who led the Chargers to just their second win in the last six games. I think we got on top of these guys pretty early and put them out their misery. They didn’t really want to play anymore. Manning dropped to 0-3 against San Diego since 2004, when the Chargers took him with the No. 1 overall draft pick and then sent him a short time later to the Giants for Rivers and a handful of draft picks. Manning was booed all day by fans who still remember the sleight they felt when Archie Manning, in the days before that draft, asked the Chargers not to take his son. And now the Giants are out of the playoff hunt. "That’s not what the goal was," Manning said. "This organization and this team expects to make the playoffs and be in contention for championships and obviously to know that with three games to go, it’s disappointing. Today’s loss was a tough one." The Chargers felt they played their most complete game of the year. They rushed for 144 yards, including 103 yards on 29 carries by Ryan Mathews. New York cornerback Jayron Hosley said the Chargers "came out fighting and came out ready to play. We came out kind of flat. We started to pick it up at times, but we took too many blows." Said Allen: "I think we got on top of these guys pretty early and put them out their misery. They didn’t really want to play anymore." Manning was picked off twice, the first time when Donald Butler came up with a deflected pass midway through the first quarter. Three plays later, Allen got open for a 43-yard play that he completed by lunging for the pylon for the score. Allen had three catches to push his season total to 61, breaking LaDainian Tomlinson’s team rookie record of 59 in 2001. Rivers was 21 of 28 for 249 yards before being replaced by Charlie Whitehurst with more than five minutes left. Manning was 20 of 32 for 259 yards, with one TD. Allen also had a 4-yard TD catch and Danny Woodhead grabbed a 6-yard scoring reception. Manning also lost to the Chargers in 2005, when Drew Brees was still their starting quarterback, and in 2009, when Rivers threw three touchdown passes, including a last-minute, game-winner to Vincent Jackson. Asked if the fans affected Manning, Giants coach Tom Coughlin said: "I don’t think so at all. I think their team affected us." New York lost for just the second time in seven games following an 0-6 start. The Chargers are tied with the New York Jets, one game behind Baltimore and Miami in the race for the second AFC wild-card spot. The Chargers visit Peyton Manning and the Denver Broncos on Thursday night. The Broncos beat the Chargers 28-20 on Nov. 10. Allen was hurt while making a 12-yard catch late in the first quarter and went into the locker room. He returned late in the second quarter and caught his second scoring pass to give San Diego a 17-0 lead. Allen said he had an X-ray on his shoulder, which was negative, and then got a pain-killing shot before going back into the game. "My shoulder’s fine," he said. "I just fell too hard, just trying to dive and get away from the contact but I ended up hurting myself." 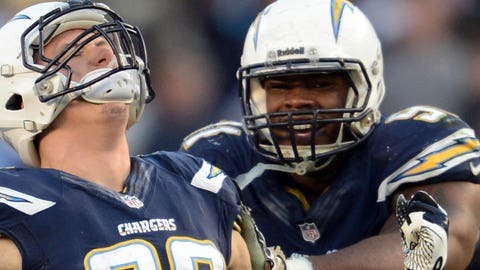 A 36-yard field goal by Nick Novak and Rivers’ TD pass to Woodhead — which was set up by Marcus Gilchrist’s recovery of Andre Brown’s fumble — helped the Chargers take a 24-0 halftime lead. The Chargers blew a 24-0 halftime lead to Peyton Manning and the Broncos last year, but weren’t about to do to same to Manning’s little brother and the Giants. Rivers was sacked by Justin Tuck and fumbled on the first possession of the second half, with Cullen Jenkins recovering at the 18 to set up Peyton Hillis’ 1-yard scoring run. Rivers appeared to injure his neck when he dove for the loose ball but stayed in the game. Mathews scored on a 1-yard run to cap an 11-play, 80-yard drive that was all on the ground except for a pass from Rivers to Vincent Brown that drew a 36-yard pass interference call against linebacker Spencer Paysinger. Manning threw a 5-yard touchdown pass to Brandon Myers and Novak added field goals of 27 and 43 yards, all in the fourth quarter. NOTES: A moment of silence was observed for Nelson Mandela before the national anthem. … Chargers OLB Melvin Ingram made his season debut after tearing up his left knee in May. He had one tackle.